Chevy is hard at work in preparing their new 2014 ‘Vette. Chevrolet has big plans for their Corvette, the most pressing of which is the progression of their all-new 2014 C7 next generation model. Reportedly in development since 2007, Chevrolet has kept a tight lid on all things C7, however a faux pas from one of their suppliers at Omega Tool Corp. has seen the front-end of the new model leaked two years early in a video clip. The short clip shows a digital rendering of the C7&apos;s front fascia and bumper. Though it was originally taken down shortly after its accidental release, a die-hard Corvette fan was able to catch it and upload it again, complete with Omega&apos;s logos and all. 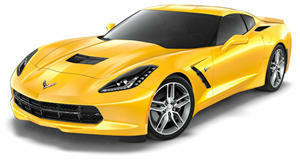 The new 2014 Chevrolet Corvette should feature the brand&apos;s new Gen V small-block V8, good for around 440 horsepower.